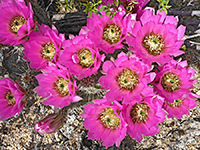 Echinocereus fasciculatus is a sturdy-looking plant with attractive, multicolored spines, often dark brown at the tips and much lighter near the stem; they are between 0.5 and 3 inches long, varying in length both for individual plants and different specimens. Spines are closely spaced, but not generally dense enough to obscure the green stems, which form small, open clusters. The large, bright flowers are borne a little way below the apex, and appear in various shades of pink or magenta. The cactus resembles several other species including echinocereus engelmannii, though this occupies a different area; one distinguishing feature is the (usually) single central spine, cf. engelmannii which has 2 to 6. The plant is quite common within its limited range; in Arizona it is found between Florence and Nogales and places further east, extending to a small area of southwest New Mexico. Other hedgehog species within this region are bonkerae, coccineus, fendleri, rigidissimus, all relatively easy to distinguish. Echinocereus boyce-thompsonii was once considered a variant but is now classed as a separate species.